A suitcase has been found washed up on the shore of the river Thames. When Detective Erika Foster opens it she sees that it contains the dismembered body of a young man. This is identical to another suitcase that was found two weeks ago only that one held the body of a woman. 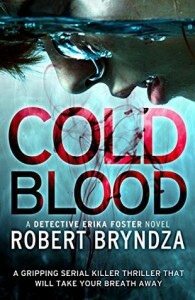 Erika realizes she's looking for a serial killer but when she begins to dig into the case she is brutally attacked. She has no choice but to take time off but her mind is still on the case. When she learns that the twin daughters of her colleague have been kidnapped, she will stop at nothing to get those girls back home safe and sound. When I find out another Erika Foster book is coming out I feel like I have to read it. I know it's going to be the same as the ones before it - Erika goes through hell and then saves the day. I know the descriptions of people are going to drive me nuts again (horse-faced girl, jowly face with several chins), and there's going to be so many convenient things that will happen to make the story fit together. But I still find myself turning the pages quickly and when the book is finished I'm happy I read it. I'm also happy that Erika is not in a relationship. I'd like the focus to be on her job. I want her to be an independent woman! Thank you to Netgalley and Bookouture for a copy of this book.